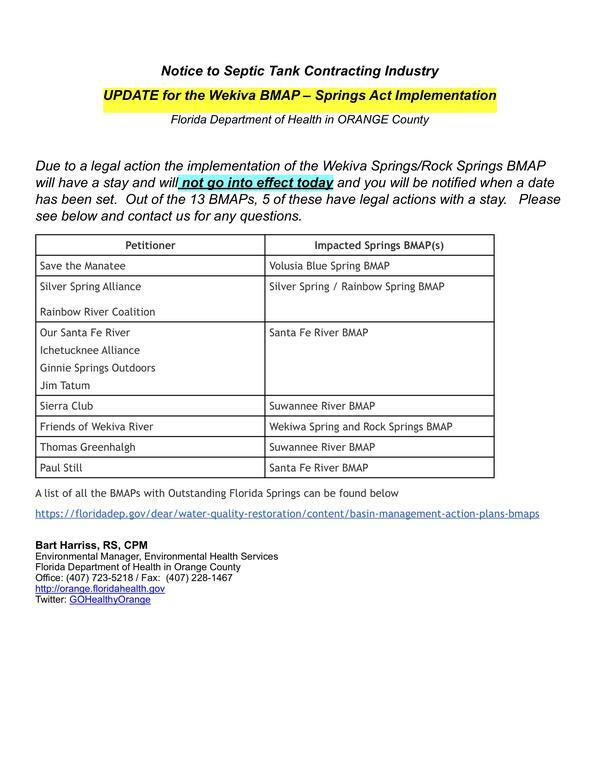 As of July 2018, DEP has developed more than a dozen new and revised BMAPs for areas including all Outstanding Florida Springs. When completed, the state's BMAPs will have placed almost 14 million watershed acres under active basin management—a total area including more than 6.5 million Floridians. On July 1, 2018, a single statewide report replaced the annual progress reports for all BMAPs. An annual statewide report of progress towards implementing water quality projects will greatly assist policymakers and local stakeholders in keeping track of the myriad of restoration strategies, and will fulfill a new requirement under Section 403.0675, Florida Statutes (F.S.). View the report. This has a 21 day challenge period and is being challenged by the HB, but could become enforceable after that period. Florida DEP announces the creation of a Biosolids Technical Advisory Committee. Check back later for upcoming Springs Meetings in your area!